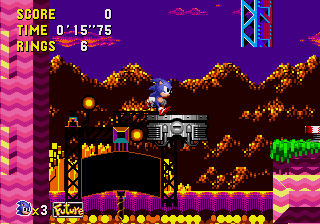 Collision Chaos is the second round of Sonic CD. Neon signs flicker through this round, metallic bumpers bounce you through parts, and bouncy bubbles hinder your progress. You'll have to go fast to get through this level. And is that Metal Sonic taking off with Amy? Chase him! Collision Chaos is the type of level only a pinball fanatic would love. It has bumpers, pits full of springs, and all those spiked little ball chains. The stage is set in an industrial construction site, similar to that of Spring Yard Zone. The level is not difficult, just watch out for the random spike traps. That, and getting stuck in the bumper "maze". Also, there are a bunch of bubble-type obstacles, just hit them and they'll disappear. This stage in the present is colorful and well-lit. Giant logs in the sky move fast, so watch out! ...once again, the world will be completely changed by Robotnik's dictatorship. Most machines are damaged beyond repair, and the lake in the background resembles an acidic waste dump. If you manage to destroy all of those machines in the past, the future will change to this utopian paradise. Mechanical plants pump clean oxygen into the air, and a city now bustles in the background. Act 2 is one of the only two levels in 2D Sonic history to have two possible exits. The other would be Spring Yard Zone Act 2. This page was last edited on 15 April 2018, at 13:01.